No one delivers disaster response communications faster. During an emergency or natural disaster, power, wireline and wireless infrastructure are critical to getting response activities underway. Unfortunately, they are often the hardest hit. Search and rescue, military, governmental, and corporate recovery teams need access to open channels of communication to better plan, prepare, and execute their recovery objectives. These operators need a easy, rapid, resilient, and capable communications infrastructure to help them to establish or re-establish communications in critical conditions. Rapid disaster response communications systems are intelligent wireless platforms that operate in the harshest conditions with their own power generation, networking, and transmission capabilities. 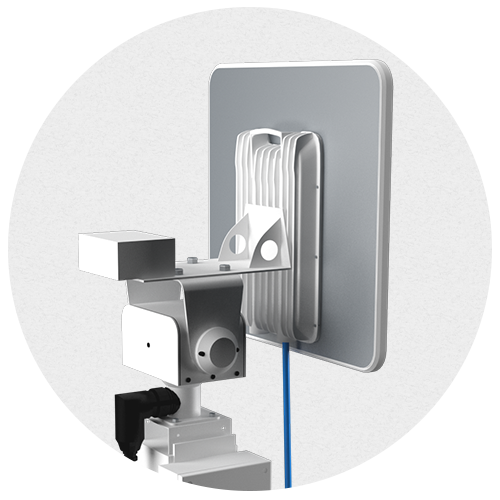 These systems help extend point-to-point (PTP) connectivity over damaged infrastructure, provide wide area network point-to-multipoint (PMP) capabilities, and serve as the backbone of distributed cell-on-wheels (COW) nodes for cellular communications. 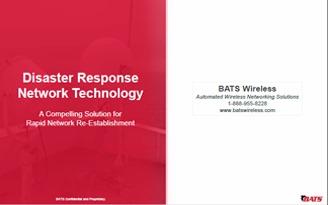 BATS’ intelligent self-aligning disaster response communications systems remove the need for highly skilled manpower to establish and maintain high-throughput, low latency links. 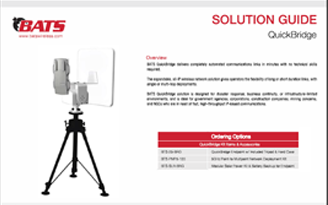 Our tool-less man portable systems provide any personnel the ability to establish emergency ad-hoc communication bridges in minutes, eliminating the need for expensive satellite connectivity due to downed or overloaded infrastructure. 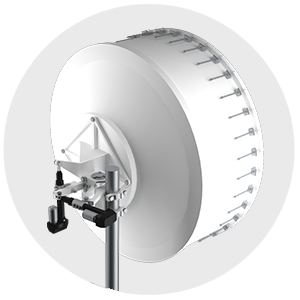 BATS Wireless gives government agencies, corporations, and NGOs the ability to immediately re-establish high-speed wireless communications networks minutes after a catastrophic event. All-IP solution for voice, video, and data. Can be run from a generator or solar array.